At an early evening Hijos del Sol art workshop, Yarely Alvarez takes a few moments to give a ride to Areli Espinoza. 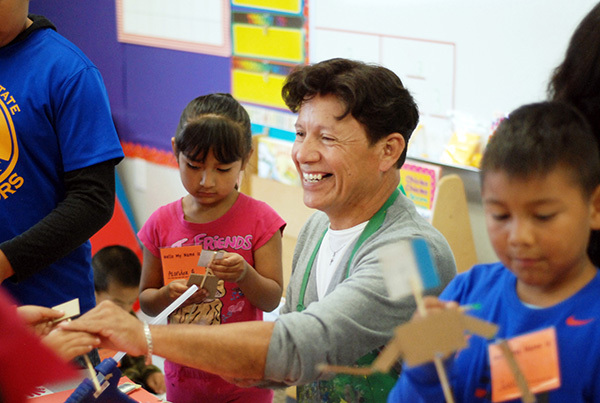 José Ortiz and his fellow artists call Sherwood Elementary School’s Migrant Activities Center in East Salinas home. Given the mythic constitution of many of his murals, one might be forgiven for thinking a blustery, egotistical personality might be behind their creation. Yet artist José Ortiz of Hijos del Sol, or Children of the Sun, is anything but. Like his protégés José Nolasco, Josué David Rubio, and Luis Aguilar, Ortiz is quiet, gracious and self-effacing, quick to give credit to the beauties of nature, and modest about his considerable artistic gifts. Since the mid-1990s, Ortiz and collaborating painters have created more than 70 works of luminous public art across Monterey County, the great majority of them in Salinas. About half of these works are in schools. An Ortiz mural is instantly recognizable, characterized by bold colors, transforming shapes, and big ideas. Each mural has a singular connection to culture, nature, legend, and infinite possibilities. His motifs are uniquely human and hopeful: mothers cradling children, families huddled over homework, laborers in green fields, and animals with mystic auras. At the Women, Infants and Children building on East Alisal Street, a watchful jaguar sits in a tree, accompanied by a boy in humble clothing, another child hiding behind the leaves. One mother holds an infant, another child peeking out from behind her rebozo, the folds in her garment echoing the furrows of the land beyond, where a conical mountain reaches the sky. Laughing youth, possibly sisters and brothers, perch on the building’s door frame, ready to play. A woman of the waves rises from the blue ocean, again holding a child in a swirl of seawater. Over all presides a proud, child with an outstretched hand, the moon within her reach, the sun illuminating the earth below. As if beckoning us to rejoin the Garden of Eden, the mural invites, delights, and asks us to remember where we came from, a vision rendered in cobalt, mustard, sienna, and emerald. With the help of other members of the group, Hijos del Sol founder José Ortiz leads a workshop for children at Boronda Meadows Elementary school in Salinas. The introductory course for kindergarten through 6th-grade students covered elements of illustration, design, fabrication, and assembly. Born in Chihuahua, Mexico, the youngest of a large family, Ortiz was recognized early as a precocious talent, making sculptures from mud and sketches from anything at hand. Resources were few, however, in a childhood in constant motion. “I come from people who have been displaced,” Ortiz says, as he talks about his mother and grandmother, who were Tepehuane medicine women. Marginalized in Mexico, the family moved often. Determined to make a better life, his mother learned Spanish, and soon set her sights on the United States as the only way forward. As a five-year-old, Ortiz found himself “stationed,” as he puts it, near the border in Mexicali, waiting for the day she could send for him. In the interim, he was to work. Five long years later, he finally had his chance in the United States, first as a young migrant laborer, then as a Salinas Elementary School student. By the time Ortiz was asked to join the Salinas Artists Association at 13, he could already draw, paint, and fabricate technically difficult pieces of art. Soon he was meeting instructors at Hartnell College, exploring what resources, encouragement, and opportunity could do. For the first time, Ortiz had a studio, and materials to work with, and design jobs and commissions soon followed. He chose ethnic studies at the University of California Santa Cruz, forgoing an out-of-state scholarship in order to help maintain the family household in Salinas. He feels strongly that college is a formative step toward personal development. Now a teacher himself, whose protégés are mentoring youth in schools across Salinas, Ortiz is a welcoming presence to youth and the creative community in Salinas. He founded Hijos del Sol in 1994. “I had the idea of making it an after-school program. I didn’t know what that would look like, but it’s been a good journey, a fantastic journey.”—José Ortiz, Founder of Hijos del Sol. 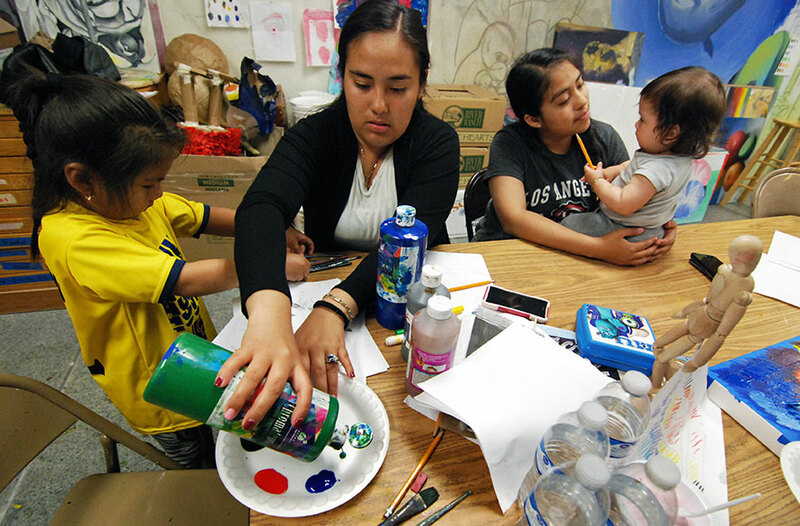 Hijos del Sol art workshops are sometimes a family affair. From left, they are Iris, Yulma, Angeles, and Arai Ruiz. Those attending classes at the Migrant Activities Center in East Salinas can learn drawing, painting, sculpture, and fabrication. The Migrant Activities Center at Sherwood Elementary School in East Salinas, where Hijos del Sol houses its studio, is a lean operation. Perhaps one-third of the space is crammed with art supplies, works-in-progress, and inspired children. There is more workspace in the next room. Tables pop up when necessary, and projects expand and contract as desired. The arrangement is friendly, and clearly serves a strong need for this kind of an artistic outlet. In exchange for the space, Hijos del Sol holds an open studio at Sherwood three times a week, where program staff conduct workshops and offer related services for free. Aside from the space, it takes a lot of materials and overhead costs to run a program like Hijos del Sol, and funding from outside sources helps to cover expenses like insurance, stipends, materials, equipment, and organizational assistance. This invaluable help has enabled Ortiz and his fellow artists to further concentrate on teaching, exhibits, and building their capacity to serve the community. 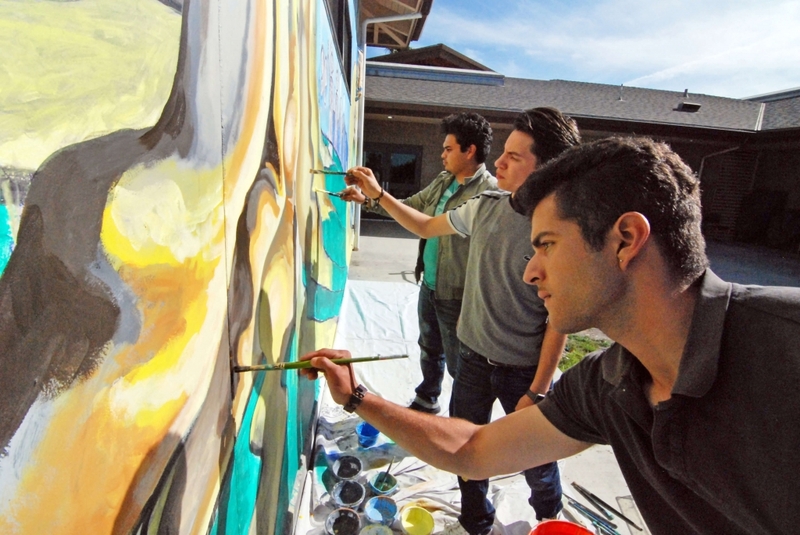 From left, in an interior courtyard at the César Chávez Library in East Salinas, Hijos del Sol artists José Nolasco, Josué David Rubio and Juan Carlos Padilla work on a mural. Sketches for the large work depict a huge tree in the center, with the wings of birds on each side sheltering groups of young students reading. For more information about Hijos del Sol, contact hijosdelsolarts@gmail.com and @hijosdelsolarts on social media.